If you need professional steam cleaning and sanitising of the interior of your car, use our reliable services. The car upholstery cleaning which we provide ensures effective and complete removal of dirt, grime, unwanted and unpleasant smells, smoke odours and pollution. Our cleaning technicians use powerful and effective steam cleaning machines which disinfect the car seats, headrests and upholstery fabrics in depth. They completely remove the stains and spills from the upholstery. The floor mats and car seats will be deep cleaned, the whole interior of the car- sanitised accordingly. 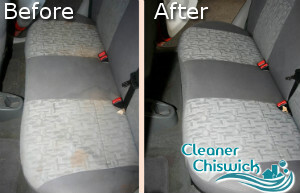 Use our highly effective car upholstery cleaning services, available in Chiswick during weekdays and weekends. Our staff of qualified cleaners can take care of the healthy and presentable state of your car upholstery. They vacuum the headrests, floor and upholstered items. Our employees apply steam cleaning on the floors, ceiling, doors and luggage compartment. They sanitise the leather seats and car upholstery using moistened in cleaning solution microfibre cloths. The rest of the upholstery fabrics will be sanitised with vacuum and steam cleaning. Our staff launder the seats and wash the car mats. Use our first-rate car upholstery cleaning services that we provide in the territory of Chiswick W4 seven days per week. Our technicians arrive in time to provide the cleaning of the car upholstery, to inspect the interior of the vehicle and do the necessary work. They use effective steam and vacuum cleaners, suitable preparations, solvents and detergents. The doors, ceiling, mats, seats, headrests, luggage department and all areas inside you car will be flawless after our staff take care of them. 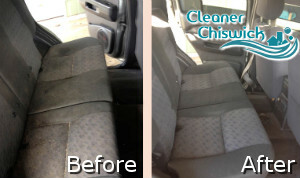 Get in touch with us to book the car upholstery cleaning which we provide in W4 at affordable rates.